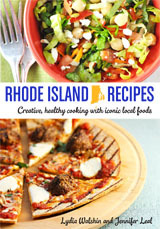 If you're thinking about giving RHODE ISLAND RECIPES as a holiday gift, why not check out the e-book version first? Same great recipes, same great ingredients, same great photos, on sale this week for just $4.99! You can read the e-book on ANY device with the free Kindle Reader app. Download the free Kindle app to read the book on any smart phone, tablet or computer. Then, click here to order. You'll be reading RHODE ISLAND RECIPES on your iPad, smart phone, computer or Kindle in less than a minute. Want to give the print edition as a holiday gift? Why not give an autographed copy of the book? We love to scribble! On October 19-20, we'll be at the Kenyon's Johnny Cake Festival. Buy a book and we'll sign it. Buy 3 or more books, and we'll give you a great gift bucket of some of the foods in our book (limited supply). Treats for all at our booth! The festival offers lots of family fun, food, music, and tours of the old grist mill. On October 25, come and see us at Dave's Marketplace, 1000 Division Road, East Greenwich, from 3-6 p.m. We'll be signing books and sampling recipes from the book (thank you, Dave's!). Come and nosh, shop, and say hello. On the weekend of October 19-20, you'll find RHODE ISLAND RECIPES (the book, and us!) in Usquepaugh, Rhode Island, at the Kenyon's Johnny Cake Festival. Sample johnnycakes and many of the food products we use in our book; meet the makers; tour the grist mill; shop for locally made craft items; and listen to great music. More than 125 local vendors: farmers, food producers, artisans and more. Jennifer and I will be there with copies of the cookbook, which makes a pretty fine holiday gift. Buy your books right there (or bring ones you've purchased previously), and we'll be happy to sign them. Then, shop at the fair for some of the foods in the book, and put together your own gift basket. We'll have some samples at our booth to give you ideas for the holidays -- and we might just give a few of those gift baskets away! The Johnny Cake Festival supports the Johnnycake Center of Peacedale, and a portion of each johnny cake sale is donated to the Breast Cancer Coalition. All resources for the fair are locally sourced. We're proud to be part of this wonderful local tradition, and we hope to see you at the festival. Yesterday I had the honor of attending the Taste Trekkers Food Tourism Conference at the Biltmore Hotel in downtown Providence, Rhode Island. I was looking forward to visiting some of Rhode Island Recipes' favorite food companies, discovering some new ones, and representing the cookbook. First up, the fabulous Narragansett Creamery, who was not only kind enough to display rack cards and a copy of our book (shown above), but also wowed the crowd with their spreads, cheeses and yogurts. You might recognize this name as they are the makers of the famous weiner spice in the Rhode Island Recipes meatballs (and meatball pizza). and one of our favorite cheese shops, Farmstead.